One such word is a ‘sneck’ usually given to a door-latch or small bolt used to secure a door. It is also sometimes used to describe snapping or biting at food or pilfering. Often in my adolescent years I was brought up short with the words, “Hey, sneck the door ahint yel” as I went off somewhat hastily to join some friends in a youthful ploy. Even my primary headmistress during the 1920’s used the word with her wayward pupils. If we were pushed for time when having a meal we would be told we were “sneckin each bite,” meaning we were snapping at our food. When my mother had baked some small cakes that I was very partial to I would be told not to ‘sneck ‘ any if I happened to be hanging around in a suspicious manner. Another common use of the word ‘sneck’ was when it was used to describe a crafty, covetous person who by long practice had gained facility in obtaining what he or she wanted. Such a one was aptly called a ‘sneck-drawer’ a wonderfully descriptive phrase to apply to an objectionable individual of that kind! 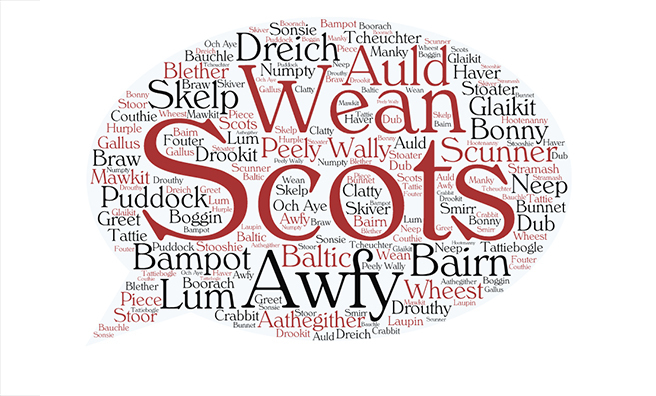 So the word ‘sneck’, like many more auld Scots words, can be said to be ‘awfa haunny’ – or useful.